She was born just about noon that Friday, the 27th of October, 162 years ago yesterday. The year was 1855, the place most likely the little village of Bad Köstritz in what is now the German State of Thüringen. 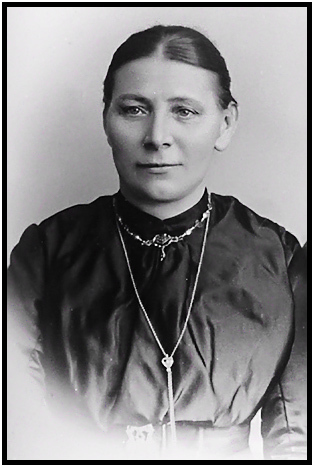 Her father was Johann Christoph Gustav Graumüller, her mother Auguste Wilhelmina (Zimmermann) Graumüller. It couldn’t have been a comfortable wedding. Emma’s father was by then a deacon of the church. Hermann, the illegitimate son of a woman who later married someone who never gave her son his name.5 But it was a long and fruitful marriage: it lasted until Emma’s death in January 19296 and produced seven children that I know of. Emma’s life must have been filled with family, surrounded by her children. And then — one by one — they began to disappear. First, it looks like daughter Paula didn’t survive. I haven’t found the death record yet, but there are no records of this child after her baptism in April of 1890. And then, only months later, came what I suspect was the perhaps the hardest parting of all. That birthday-present first-born daughter, Hattie, sailed for America in the summer of 1890, sent to live with Emma’s sister Auguste (Graumüller) and brother-in-law Frank Schreiner in Chicago.9 Auguste had no children; Emma had all those mouths to feed; you can imagine the letters going back and forth with promises of a good and rich life. A full life. A rich life. Years of living. Years of losing. The strength of bidding farewell, over and over and over. You were an amazing woman, Emma Louise. What a very nice story. It’s always nice to see an ancestor as a real person rather than just a name in a chain of names. Even today our goal as parents is to raise our children to be independent so they can thrive on their own. That was undoubtedly even more important in the past. I imagine our ancestors were much more stoic, strong, and realistic than we are today. My grandmother and grandfather both came to this country as teenagers, unaccompanied, to live with relatives. My grandmother died at age 26, my grandfather at age 32 far away from where they had lived with relatives. I often wonder if word ever got back to their parents that their children had died. And it’s those “I wonder” and “I wish I knew” things that haunt us, isn’t it? Thank you. This is poignant and relatable on so many levels. I’m grateful you could piece Emma’s story and context together with the records. Without womens’ words we can only imagine how Emma Louise felt. Thank you for remembering her and her valiant life. Just saying her name again brings her back to life. I love to read the stories about your family, Judy. They give me insight into what my recent immigrant ancestors might have gone through when they came to America in 1881 and 1892. It really makes us think when we look at what they faced, doesn’t it? This last week I had the same realization about German ancestors of mine. This couple had eight children. He was a small farmer by listed profession, and as they aged, all eight children emigrated; some to Wisconsin, some to Uruguay. Father died a few years later, but Mother lived almost another decade in that tiny German town. My own children, when told about this, found the story of that mother, all alone, very painful. I tried to emphasize how glad she probably was that her children and their children were carving out prosperous lives, but the truth is, it *is* sad.